I’ve totally lost my mind. Seriously. 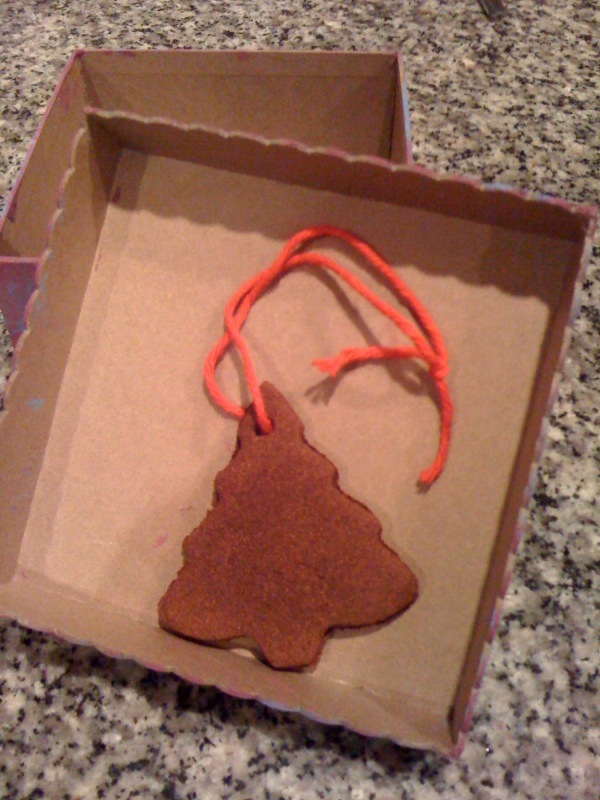 I had planned to make cute little gift boxes and cinnamon ornaments for the monsters’ teachers. I thought I had a couple of days to do so. However, I got a note tonight that Littlest Monster’s gift needs to be taken to school TOMORROW. *dies* So we made a quick trip to Wal-Mart after the miserable Chiefs’ game and I bought all the supplies. First up, we made ornaments out of cinnamon, glue, and applesauce. It sounded sooooo easy. In reality, I couldn’t get my dough dry enough. I went through 3 bottles of cinnamon and finally figured out it was easier to roll out small portions of dough at a time, liberally dusted with more cinnamon. Since I needed them for tomorrow, I baked them in the oven at 250 degrees for at least an hour. Meanwhile, I got the monsters started on their boxes. I bought inexpensive brown boxes and paint. Yes, I told you I was insane. Monsters and PAINT? *dies* But they did a lovely job. 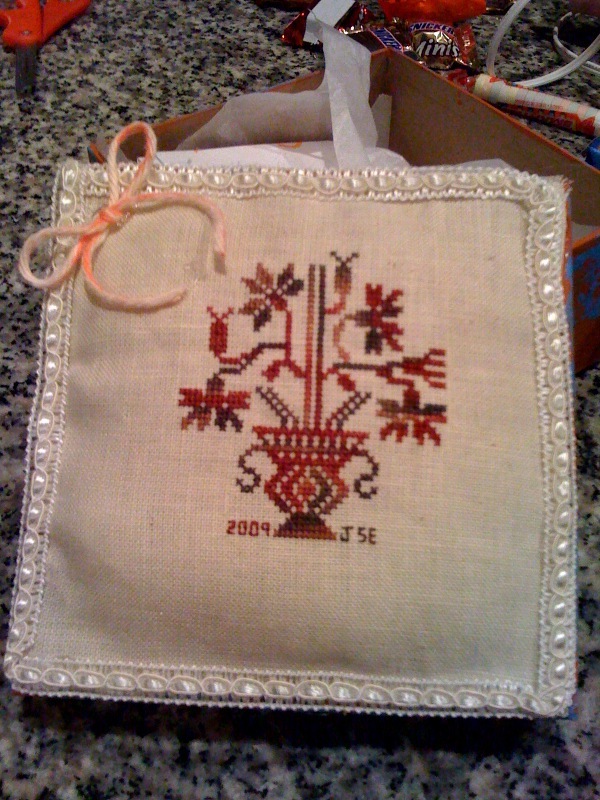 For the tops, I used small cross stitch pieces I did earlier in the year (the only smart thing in this whole evening). The linen and silks are both from Vicki at Hand Dyed Fabrics. 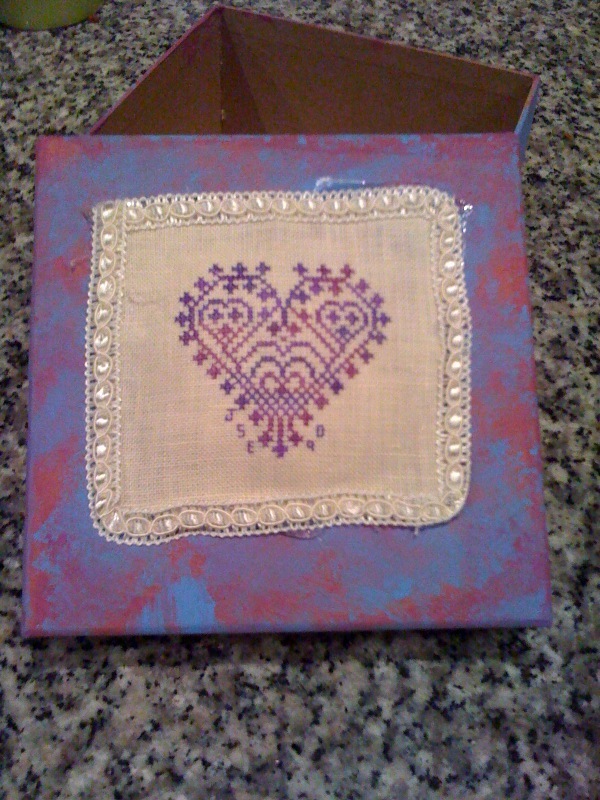 The swan and flower are from Ackworth School designs that I picked up at Needleprint, and the heart was a freebie from somewhere. I pulled out the glue gun and stuffed a little fiber fill underneath to give it a little texture, and then added a little trim. They’re far from perfect. 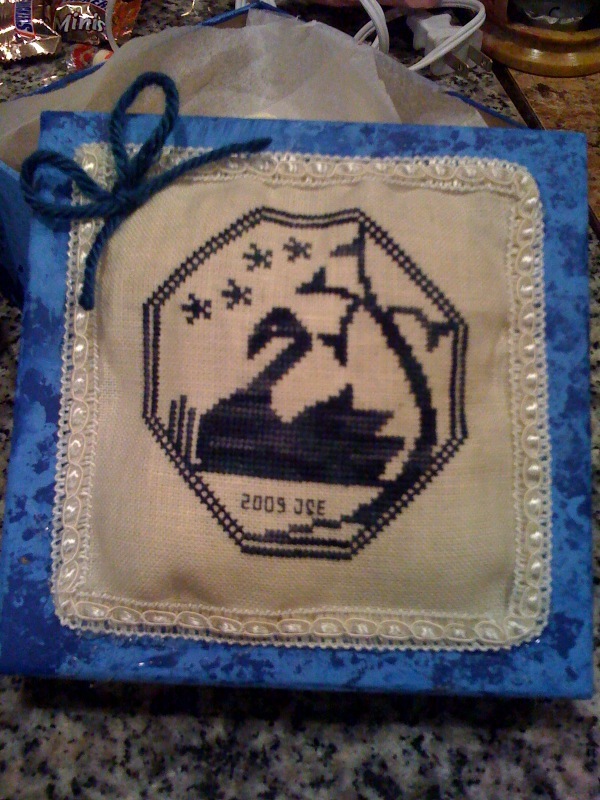 The swam one came out the best — because it was the third one I did. Hopefully the teachers will love them. Just in case, we also stuffed the boxes with mini chocolate bars. Thanks, Sis! We got the original idea of painting those boxes from YOU! They look great! I’m sure they were much loved by the teachers.